There’s no way of getting around it; as a support agent, you probably spend most of your day working on tickets. And numbers are pretty much the gold standard when it comes to differentiating among them. But in order to provide amazing service, your customers can’t feel like just a cog in a machine – and there’s no better way to do that than to connect with them on a personal level. On February 25th, Randi Busse, author of Turning Rants into Raves: Turn Your Customers on Before They Turn on YOU!, joined us for a webinar to share how you can improve the customer experience by having better conversations with your customers. To get ready for the event, we spoke with Randi about some of her experiences both as a customer, and as a customer service trainer. 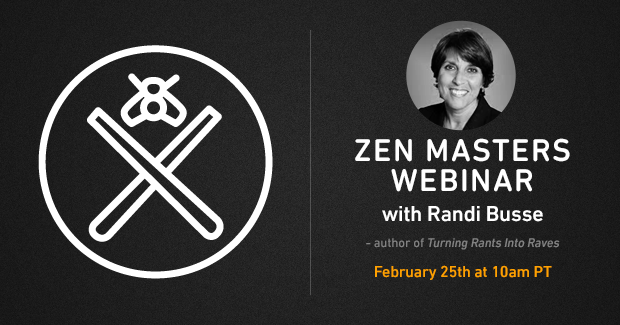 Were so excited for you to be joining us for another Zen Master webinar! In your last session, you introduced us to two characters, Rant and Rave. How do they approach the idea of customers and ticket numbers? Rant doesnt care how many ticket numbers there are in queue. Each ticket (customer) is the same to her. There is no enthusiasm in her voice. She doesnt care if she solves the customers problem or not. Rave treats each customer like an individual, although their questions or problems might be the same as every other customer she speaks with. She personalizes each conversation and adapts to the customer. How about you – have you had a customer support experience lately where the agent connected with you on a more personal level? I wish that I could say that I did! I actually had a bad experience with my health insurance company. I called the number on the back of my card. I gave the representative my information and she told me she couldnt find me in the system and she would transfer me to another group. When I got the next representative on the phone, I gave them the same info and they told me that they were a different division and that I needed to speak with the original department that answered my call and transferred me to her. That took about 11 minutes. When I got transferred back to the first department, I gave the new representative my information and then I got disconnected (or hung up on  next sure which). I called the same number I originally called and the representative that answered was able to find me in the system and answer my question. She also apologized for the frustration I was feeling. So, whats it like to go out to eat or to shop with a customer service expert? My companion usually looks at their own customer service experiences a little bit differently afterwards. Its hard to not focus on the customer experience when Im the customer. After all, thats one of the reasons why I started this business. Its a bit selfish actually! I wanted to get better service when I was the customer. I figured Id help myself by offering these services to companies that I patronize!